Championship leaders Newcastle United could be promoted to the Premier League as early as the weekend after a hard-fought win over Nottingham Forest. Should United beat Peterborough and Forest lose to Bristol City, the Magpies will bounce back into the top flight after one season away. 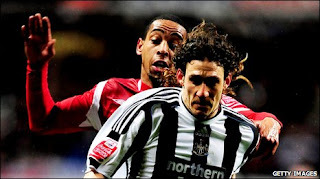 They secured a 2-0 win over promotion rivals Forest after substitute Shola Ameobi scored in the 71st minute. Jose Enrique blasted the ball past Lee Camp for Newcastle's second late on. Despite a goalless opening 70 minutes, this top-of-the-table clash proved a gripping encounter from start to finish, with Forest playing their part as they looked to bring their run of six away defeats to an end. "It's that close. We are where we are and we thoroughly deserve to be where we are and if [winning promotion] happens on Saturday, then no one will be more delighted than me. "But the most important thing is we have to win first. "The nature of our business is you have to enjoy the wins and it will be a nice day tomorrow at the training ground. "I'm quite sure everybody will have a spring in their step. But we very quickly have to bring them back down to earth. "If we are able to take a spare chunk of what we had tonight into [Saturday's game at Peterborough] then we have got a good chance of coming away with a victory." "I'm not admitting defeat, I am saying I think Newcastle United, in my opinion, will finish the job. "We've got a challenge for second place that is very much still on the go."